Sad to see them close their doors. Olympic Arms is closing its doors after being in business for nearly a half century. The gun manufacturer which specialized in AR-pattern firearms made the announcement on its Facebook page as well as in a letter circulated to dealers and distributors on Wednesday. “The Schuetz family would like to express their heartfelt thanks to all their friends, associates, and partners that have been a part of the Olympic Arms experience,” said the announcement. “Most of all we would like to thank our loyal customers and patrons who have been with us all this time,” it continued. It’s always sad to hear news about a gun company shutting down, especially after so many years in business. 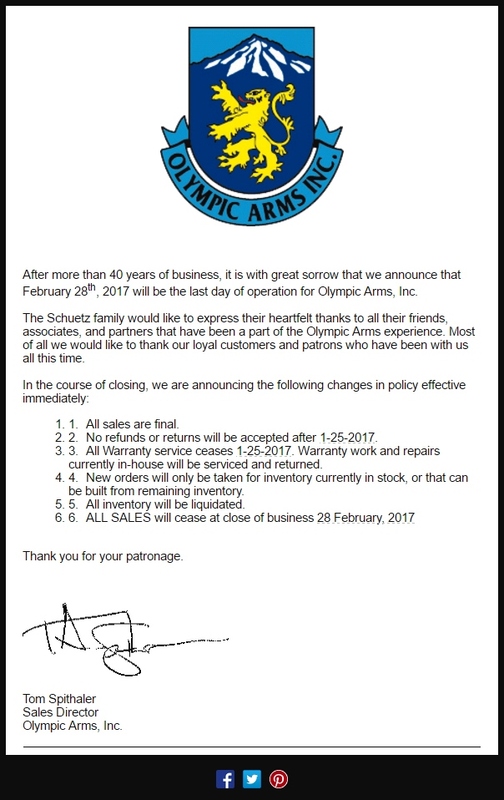 Best of luck to the Schuetz family and the employees of Olympic Arms. 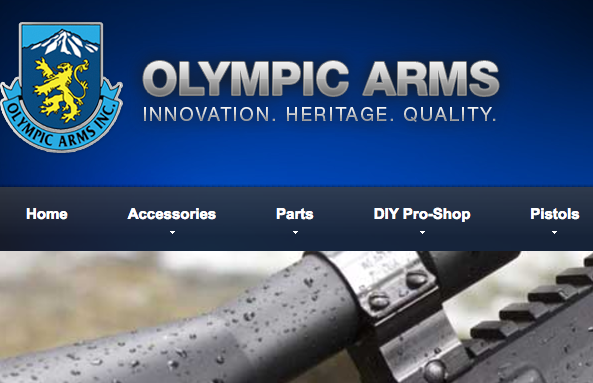 To shop for firearms from Olympic Arms on GunsAmerica, click here. Next post: The Ultimate Precision Rifle? Armalite AR-10 PRC in .260—Full Review. Any company that made ARs over the last 8 years and is not floating in cash is a very poorly ran company. Until last Nov most stores could not keep them on the shelf and prices were highway robbery. Hope some picks up the Wolverine. I bought an Olympic Arms AR-15 during the assault rifle gun ban period. To evade the restrictions, Olympic Arms ground out the bayonet mount so it did not function, used a flash hider that did not have the grooves milled out, and named it a PCR – Politically Correct Rifle. I never could get it to function in a reliable manner. The carrier key screws started backing out after firing only about 500 rounds. Rather than buying a carrier key staking tool, I went ahead and bought a new bolt carrier group. Even with the new BCG, it continued to have periodic failures to eject. I gave up and moved on to other rifles. Olympic has been on the fringes for several years, and there must be reasons, although I personally have no experience with Olympic products. A natural result of less regulatory threat on the Black Rifle part of the gun industry is that prices are falling, since few people are now in a panic to buy “cause they’re going to be banned soon!” Seeing the marginal companies drop out is going to be a consequence. I can name–but won’t here–several more companies that are probably going to be gone in the next year. That’s just the way it is. But I think another consequence, one that we will welcome, is more innovation since companies are going to have to fight for our dollars. And not just in the AR segment of the firearms market, but through the whole range. Mike I agree with you. I called Olympic a few years ago about a AR lower , the customer service was very poor and the guy I talked to was paranoid about the ATF and talked me right out of doing any dealings with them,I guess they talked them selves right out of business.I am sorry to see any firearms company go under but the climate for AR 15’s is cooling off. Thank You for the AR Lowers you made ! To bad your field testing & R&D stunk ! 9mm upper that used a spring on a pin drilled through the upper receiver to ride in the bolt carrier grove to eject the shell ! Any other company with good management would be richer than Trump ! Just look at RUGER now that Bill finally died ! THAT AHOLE wouldn\’t ever sale a 20rd mag for a AC556 to a police officer with a department leader head , they only sold to departments only with P.O\’s. # ! The shithead is rolling over in his grave KNOWING THEY NOW THREAD BARRELS AND MAKE SUPPRESSORS ! Remember how COLT treated civilians ! I own an OlyArms .45ACP upper on a lower converted to use M3 mags. It has run flawlessly for hundreds of rounds. Very sad to see these guys close shop. I hope someone buys the intellectual rights and can bring the good back to market. Over the years I have owned 2 Olympic Arms pistols: both .22s. And both had to go to the gunsmith for failure to feed and constant jams: the Wolverine .22LR jammed on every other round, and the Supermatic looked great, but would not take any but one brand (CCI mini mags). Hope someone buys the company, and engineers these two so they function: loved how they looked! Olympic has the best designed AR pistol caliber uppers on the market. They run FLAWLESSY!!! It’s a shame to see them go under, great product support and staunch 2A supporters. If Colt was smart they’d buy the rights to those designs…then again Colt was never smart. Bad news on the Cobra Dr. Smith, they’re not what you’d expect in a Colt revolver. The two Colt had on the range for Media Day at the Shot Show locked up by 11AM. Colt does not produce them in house, all the parts are subbed out and they are only assembled in East Hartford. They are more a Charter Arms quality handgun with a Colt logo on them. Very disappointing, but I feel that Colt is going in the same direction as all of the gun companies owned by Freedom Group. They are cutting costs at the sake of quality and living off their brands past reputation to satisfy the profitability expectations of the major shareholders…for now. This is what happens when you bring in “Beancounters” for upper management to replace real gun people. I believe one of Colt’s VP’s came from an automotive company a few years ago, great move if you’re concerned about profits over quality and reputation. My prediction is Colt will either go the way of the dodo bird or be swallowed up be Freedom Group within two years. My well used Olympic AR was built in 1998 and is still going strong. I wonder how many of these newer budget ARs will be able to say the same in 20 yes? Sad news. Guess its really not surprising. Considering the glut of AR-15s on the market, with several more recently introduced, along with the rock bottom prices to try and move inventory. The little gun shop near me has had the same Ar15s in the rack for months now. So a company that really only made AR-15s, with no other products to keep them afloat in such a market, not really a surprise they would go under. One can expect more of the AR only companies to go under. You know the market is bad when you see email sale ads saying you get a free AR lower with purchase. I never owned an Olympic Arms product myself but I know many who have, and I always noticed the tons of different options in calibers and innovations that very often was way ahead of other companies in offering which means they were enthusiasts themselves and working their butts off to earn a living. I now look back and attribute never owning their products as being attributed to the brand snob disease,and I suspect this is main reason for the demise? Too often a brand is overlooked for being a great value or not being over-hyped! I get mad at myself when I catch myself falling for that and I always hate seeing a American company go under! I hope Trump revives this nation and Olympic Arms can revive itself and put those ppl back to work making something. The gun industry is in need of real innovation and not just copycat guns of all the greats I hope We don’t see anymore firearm companies go under! I don’t like to see any private business go under but I think the gun trade is going to be going through some lean times now that America’s best gun salesman is out of office. I built my collection over the last 30 odd years by buying, selling (legally) and trading but the only new gun I’ve brought in the last five years was a CZ 75D Compact as a Christmas present for my wife. I, and I imagine many like me, are done buying and are keeping what we have or even selling off collections and keeping only what is essential. Competition and a non responsive market will hurt mid and lower level manufacturers who don’t have the capitol to stay afloat in leaner times, but I can’t help but think there is more to this story than what was printed. I don’t want to see the firearm industry as whole hurt but! Seeing we now have a Second Amendment friendly president in office, I look forward to being able to buy firearms and related items at much more reasonable prices. You can not tell me that unscrupulous firearm retailers were not price gouging! During the height of the hysteria, I knew people who paid over two thousand bucks for AR-15’s and twelve hundred for AK-47’s just because they feared they were about to be banned. Even if they were never fired, they couldn’t sell them now without taking a major hit! Totally agree. During one of the last scares, been so many I couldn’t tell you which one, I heard the manager of a store I frequented tell a sales clerk to tack $200.00 on to the price of a $600.00 AR. I walked out and have never been back.